Day two in Moscow is drawing to a close. Much of my time so far has been organisational- getting registered, getting cards to get in and out of my dorm and university buildings, traveling to meetings, taking Russian language lessons. When not doing this (or catching up on sleep because its all so exhausting), I went to see a few things. 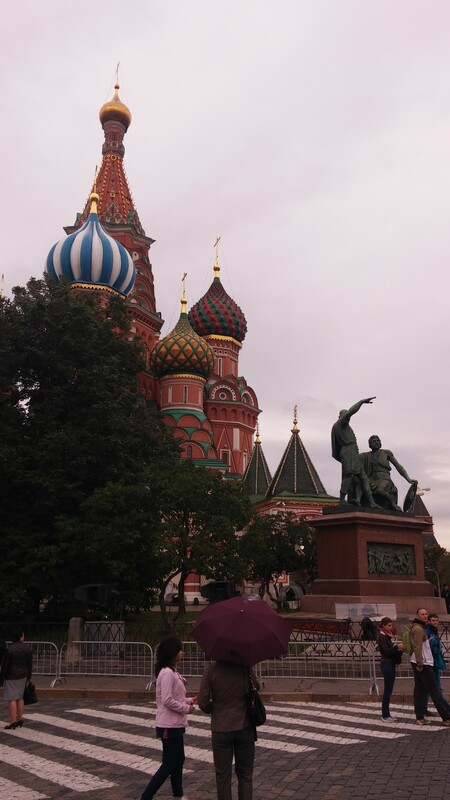 For one, we stopped by the Red Square, which was consumed by a ‘Military Music festival’ for which they had even built seating above Lenin’s Mausoleum. Complete with an ‘assemble a rifle’ stand, I felt like it couldn’t get more stereotypical . Our bags were searched upon entering the square by burly police men, we had to walk through metal detectors, and the marching band accompanied a horse show, in which white horses paraded around on command. 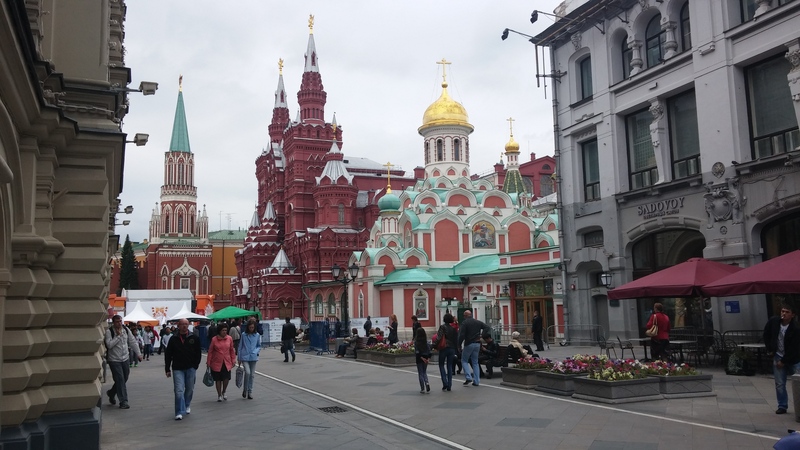 We also saw the GUM shopping centre (from the outside), and the great cathedral which everyone associates with Moscow, St. Basil’s Cathedral. Today we spent more time in ‘our region’ of Moscow, which is far less glamorous, although it is fairly near Kievskaya station, which is a larger hub, and has a very large and expensive shopping centre next door. We chose to take the metro slightly further out, and there spent far too long in a large shop getting everything from towels to saucepans and laundry liquid to equip ourselves with everything we need to live and importantly, to cook. On the metro home (well, actually, whenever we spoke English on the streets) we got strange looks, which led to the title of this blog- wielding a saucepan and looking threatening, I became Moscow’s first ever Saucepan Vigilante. So far, this has been a very trivial profession, basically I made eye contact on the metro and frightened poor babushkas. я шучу! я шучу!